What is corrosion of steel? Corrosion of steel is an important phenomenon that need to be understood properly. According to ASTM, corrosion is “the chemical or electrochemical reaction between a material, usually a metal, and its environment that produces a deterioration of the material and its properties.” In reinforced concrete, corrosion cause formation of rust around the steel bars which is as big as two to four times the original volume of steel. 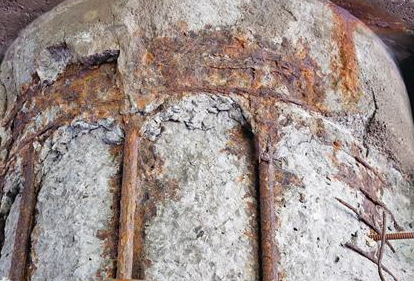 Corrosion also produces holes in the surface of steel in embedded concrete due to which cross sectional area of steel is reduced which in turns reduces structural strength of the steel. Why is corrosion of steel a concern? Concrete is weak in tension and strong in compression and steel is good in tension. To enhance tensile properties of the structure, steel is used along with the concrete which makes it reinforced concrete. Reinforced concrete is used in structures which are subjected to tensile and flexural stresses. These stresses come from structural loads, live and dead loads, traffic, winds and earthquakes etcetera. Corrosion of steel results in loose bonding between concrete and steel which in turn results in spalling of concrete. This makes structure weak and unsafe. Corrosion also produces holes in the surface of steel in embedded concrete due to which cross sectional area of steel is reduced which in turns reduces structural strength of the steel. Why does steel in concrete corrode? The corrosion of steel in concrete is an electrochemical process which requires presence of moisture, oxygen and some catalyst to start electrochemical process. In this process, iron in the steel is oxidized to produce rust, which can be as big as two to four times the original volume of steel. Steel when casted in concrete is in passive condition. Sometimes concrete structure is exposed to such environmental conditions which makes chlorides absorb in concrete. These chlorides penetrate the concrete and reaches the structural steel. This provides a favorable environment for process of corrosion to start. This process can also be started due to carbonation of concrete. However rate of corrosion in carbonated concrete is slow as compared to corrosion due to chloride. Corrosion of steel can be prevented by producing good quality of concrete and by providing appropriate concrete cover around reinforcing steel bars. Quality concrete can be produced by keeping water to cement ratio as low as possible. This will prevent chloride penetration and carbonization of concrete. To avoid penetration of chloride into concrete, water to cement ratio should be less than 0.4. And to avoid carbonization of concrete, water to cement ratio should be less than 0.5. Water to cement ratio can be reduced by increasing cement content or by reducing water content by using water reducer admixtures or super plasticizers. Quality of concrete can also be enhanced by air entertainment through air entertaining admixtures. Air entertaining admixtures introduce very tiny air bubbles in concrete also called air entertained bubbles. These air bubbles increase the concrete’s resistance to damage caused by freezing and thawing. Air entertainment also reduces segregation and bleeding of concrete and thus permeability is also reduced as concrete has no bleed channels. Cracks in concrete is another reason of corrosion of steel. Cracks along with spalling and scaling of concrete can accelerate corrosion process of reinforcing steel bars. Cracks, spalling and scaling of concrete can be reduced by properly execute finishing operations of fresh concrete. Cracks can also be minimized by providing correct amount of steel. Reinforced concrete should be properly designed as per guidelines of ACI standards to minimize cracking. As per ACI, maximum allowable crack width to avoid corrosion is between 0.006 inch and 0.007 inch depending upon environment in which concrete is to be used. Proper concrete cover plays very important role in controlling corrosion. Chloride penetration and carbonization cannot be stopped even in low preamble concrete. However these processes can be delayed by increasing concrete cover. In general, chloride will penetrate 4 times slower in 2 inch concrete cover as compared to 1 inch concrete cover. ACI 318 gives recommendation for concrete cover to be 1.5 inch for most of the structures. Concrete cover increases up to 2.5 inch depending on environmental conditions which are more liable for chloride ionization or carbonization of the concrete. Concrete cover also depends on size of aggregates. Larger aggregates in concrete require increased covers. As a rule of thumb, if aggregate size is greater than ¾ inch, add ¾ inch to maximum aggregate size to have minimum concrete cover to be used in deicing salt exposure. And if aggregate size is greater than ¾ inch, add 1-¾ inch to maximum aggregate size to have minimum concrete cover to be used in marine environments. For example, concrete with 1 inch aggregate in a deicing salt exposure should have a 1-3/4 inch minimum cover and if same is to be used in marine environment than cover should be minimum 2-3/4 inch. The concrete must be consolidated and cured properly. Concrete with water to cement ratio of 0.40 should be cured for at least 7 days at 70°F (21 °C). Increased water to cement rations increases required curing time. For example concrete with water to cement ratio of 0.60 should be cured for at least six months to have same performance as that of 7 days curing for 0.4 w/c concrete. Increased curing times reduce porosity of concrete which will in turn reduce corrosion of the structural steel embedded in concrete. Corrosion can also be reduced by adding corrosion resistant additives to concrete. These additives include silica fume, fly ash and blast furnace slag which reduces permeability of the concrete. Water repellents can also reduce the entry of chlorides and moisture to a limited extent. There are some other corrosion protection techniques which include protective membranes around steel bars, epoxy-coated reinforcing bars, cathodic protection and concrete sealers (if reapplied every four to five years). Use good quality concrete. Which can be produced by air entertaining with a water to cement ratio of 0.40 or less. Use concrete cover of 1.5 inches as minimum and at least ¾ inch larger than the nominal maximum size of the coarse aggregate used in concrete. Increase the minimum cover of concrete to 2 inches for deicing salt exposure and to 2.5 inches for marine environment. Ensure that the concrete is consolidated and cured properly. Use corrosion resistant additives like fly ash, silica fume and blast-furnace slag.